More than a month after Japan's devasting 9.0 magnitude earthquake and massive tsunami, there's still a lot of work to be done to relieve the victims. While many robots have been sent in to help deal with the high radiation issues in Fukushima, one machine is contributing by being able to film underwater and also potentially save lives. 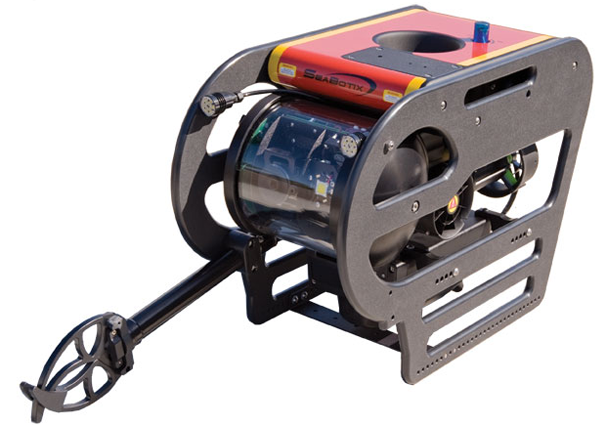 The SARbot by the Center for Robot-Assisted Search and Rescue (CRASAR) in Texas can dive down 150 meters to film underwater, and is protected by a polyethylene bumper. In the case of the Japanese tsunami, while a humanoid remains above the surface with a video-enabled PC, SARbot can swim through the wreckage and film clearly through the dirty water. That long claw on the front of the robot is there to grab arms or legs if it happens to find a living thing in need of assistance. SARbot was tested recently in the Rikuzen-Takada area alongside Japanese Coast Guard divers, as they are forbidden to go through rubble or houses under the water, so cannot look for bodies or survivors. The good thing is SARbot didn't find any dead bodies, but sadly also didn't find anyone trapped. Lets hope the little robot will get more chances to help save lives. Check out a quick video of it in action at Rikuzen-Takada below.